Maple Bacon Peanut Butter Rolls are an easy from-scratch cinnamon roll recipe that are made extra special! Filled with creamy peanut butter, bacon, and topped with an irresistible peanut butter maple glaze. These rolls are melt in your mouth delicious! Is there anything better than waking up to a soft, fluffy, gooey, cinnamon roll in the morning? The answer, my friends, is absolutely not…..unless it’s a cinnamon roll that contains bacon. Then, it’s even BETTER! You should probably have your coffee before you consume one of these rolls. Waking up suddenly to the amazing flavor combination that’s packed into these babies might be a shock to your system and just completely blow your sensitive morning mind. Fair warning! I’m going to go ahead and give you a step by step of these rolls with pictures. That’s how much I like you all. I know that back when I started attempting baking with yeast, pictures were super helpful. My goal is to make recipes like this SIMPLE, so that anyone can make them! First things first, let’s get the yeast going! The picture above shows you what your yeast will look like when it’s proofed. This is how we know it’s alive and well and is going to make our cinnamon rolls rise up perfectly. I recommend melting your butter slightly in the microwave, then add the milk, and the sugar. Then you will microwave just about a minute until very warm. Add your yeast, let it sit and get foamy! 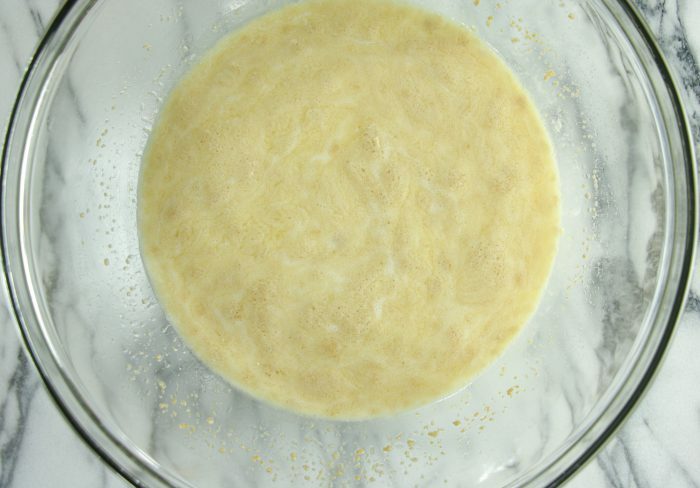 The next picture you just scrolled past is showing you the dough after the egg, salt, and two cups of flour have been stirred into the yeast mixture. As you can see it looks “shaggy” and had just started to pull away from the sides of the bowl. That means, it’s time to plop that dough out and get busy kneading! Or, use your stand mixer if you don’t like to get all “floury” I personally like to mess around with my dough and almost always knead by hand. 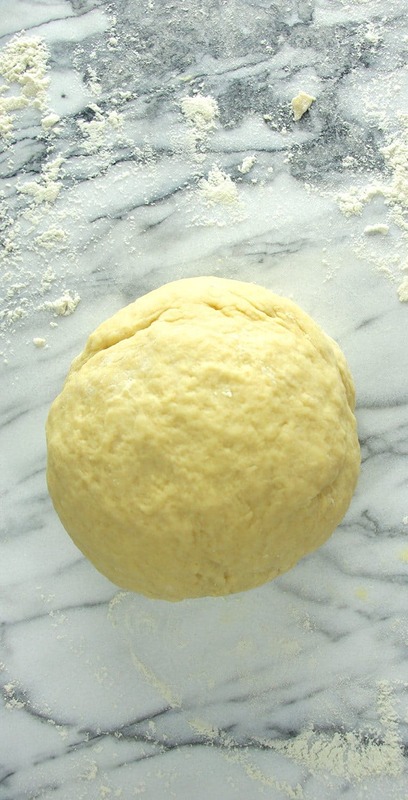 There you have it, your beautiful ball of dough after you have kneaded in the rest of your flour. This only takes about 5 minutes. Not even close to being fussy. Now, go ahead and spray a big bowl with non-stick spray, stick the dough in there, and let it sit and do it’s thing for about an hour. If you’re like me and procrastinate on EVERYTHING except baking, this would be a good time to do your laundry! I’m going to tell you friends a secret. Only a few years ago did I have my mom show me how to roll my cinnamon roll dough out into a dang rectangle. Before then I could only manage to get a circle! Every time! The rolls still tasted good, but I was determined to get that rectangle. So, if this is your first time, or your fiftieth time and you get circles instead of rectangles, I feel your pain. Don’t even worry about it. Just make sure your dough is about 1/4 inch thick. 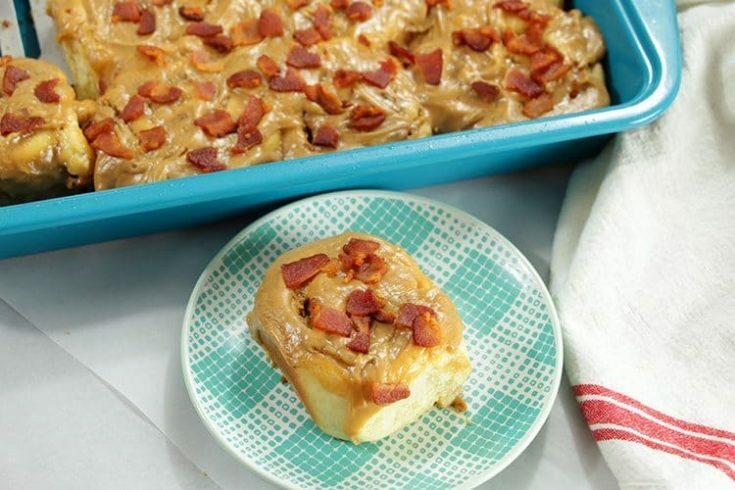 Go ahead and slather that dough with peanut butter, sprinkle with that brown sugar/cinnamon mixture and crumbled bacon….try not to start salivating all over because of how yummy this already looks. You know, basic stuff. After you spread the goodies on your dough, start at the long end, and roll the dough up as tight as you can. Pinch the seam to keep the good stuff inside, and cut into 1 inch slices with a serrated knife. Go ahead and get those rolls into your prepared pan. Try to be patient, they need to rise for about 20 more minutes. I know that really sounds awful, but trust me, these are worth the wait! I like to spread the peanut butter maple frosting on the rolls pretty much as soon as they’re out of the oven. It kind of melts a little bit into all of the crevices and there is nothing more tasty than that! If you all didn’t know, I am a little obsessed with maple/bacon things. I originally made these Maple Bacon Cupcakes, and then decided to turn them into cinnamon rolls, and, well, who know’s what’s next! Place the milk, sugar, and butter cubes into a medium microwave safe bowl. Microwave mixture until warm but not hot. Butter should be at least mostly melted. Add the yeast to the warm milk and allow to sit for 10 minutes, until foamy. When your yeast mixture has proofed (is foamy) pour into the bowl of your stand mixer. Add 1 cup of the flour, along with the salt and egg. Using paddle attachment (or a large spoon if you're not using a mixer) start to blend ingredients together while adding remaining flour in 1/2 cup intervals. When the dough starts to leave the sides of the bowl, switch to your paddle attachment and allow dough to knead for 5 minutes. Or, pour dough out onto a well floured surface and knead by hand for 5-7 minutes. Pat dough into a ball, and place in a large, lightly oiled bowl to rise for 1 hour, or until doubled in size. While dough is rising, mix together the brown sugar, cinnamon, and crumbled bacon in a small bowl. When dough is doubled in size, remove from bowl onto a floured surface and roll out from the center into a large rectangle (about 12x14). Spread the dough evenly with the peanut butter and sprinkle with the brown sugar/cinnamon/bacon mixture. Starting at the long side of the rectangle, roll dough up tightly, and pinch the seam to seal the dough. Slice the dough into 12 equal rolls. Spray a 9x13 inch pan with non-stick spray, and place rolls in the pan. Allow the rolls to rise for 20 minutes. Bake rolls 15-20 minutes until lightly golden brown. When rolls come out of the oven combine all of the frosting ingredients with a hand mixer or whisk until well combined. Spread frosting over warm rolls as desired.